Additional Info: Many more extras - see full list below. * Prices are for a week stay (Friday to Friday). * A non refundable deposit of £100.00 is payable to secure booking, with the balance due 6 weeks before the holiday. If the booking is within 5 weeks, then the full amount is payable at the time of booking. 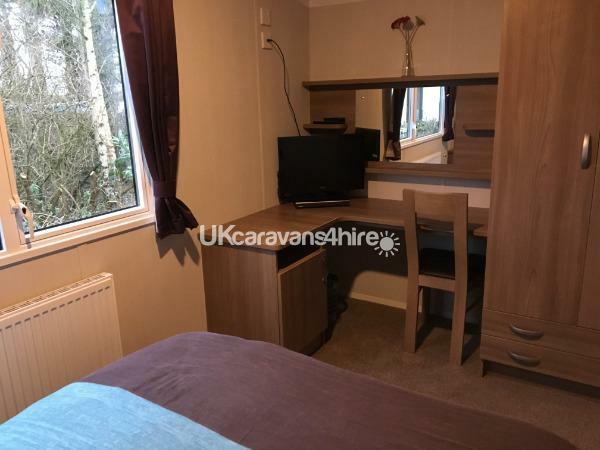 * A refundable security deposit £100.00 will be returned within 7 days, after the caravan is cleaned and checked providing no loss or damage. * Please leave the caravan in the same way that you find it - clean and tidy. PLEASE NOTE I DO NOT INCLUDE PASSES - THEY CAN BE EASILY PURCHASED UPON ARRIVAL AT RECEPTION - NOR DO I INCLUDE BEDDING. PLEASE NOTE I DO NOT INCLUDE PASSES - THEY CAN BE EASILY PURCHASED UPON ARRIVAL AT RECEPTION - I AM UNABLE TO INCLUDE BEDDING IN THE PRICE. AVAILABILITY UPDATE April 2019 - PLEASE READ!! More dates vailable please enquire! Dogs welcome - Small extra supplement payable. Van has BOTH front decking AND a secure lockable platform step! 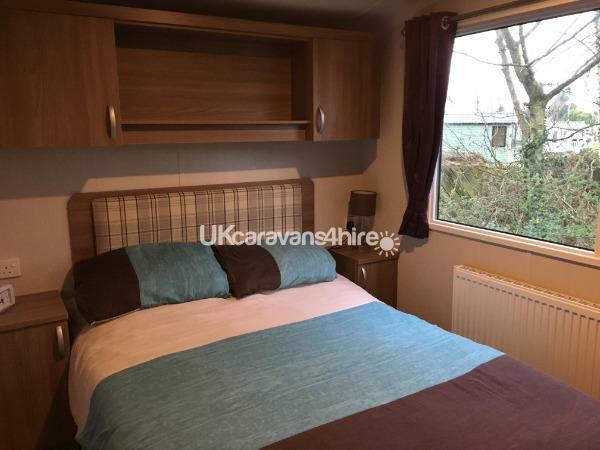 Our newest caravan is located on CADER IDRIS - a 5-minute walk from the amenities. 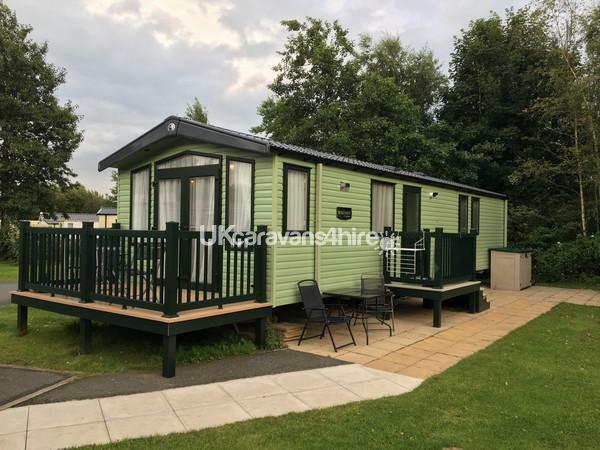 The caravan is sited on a lovely big plot in a cul-de-sac (so no through traffic), 5 minutes to the amenities (but far enough not to hear them!!) 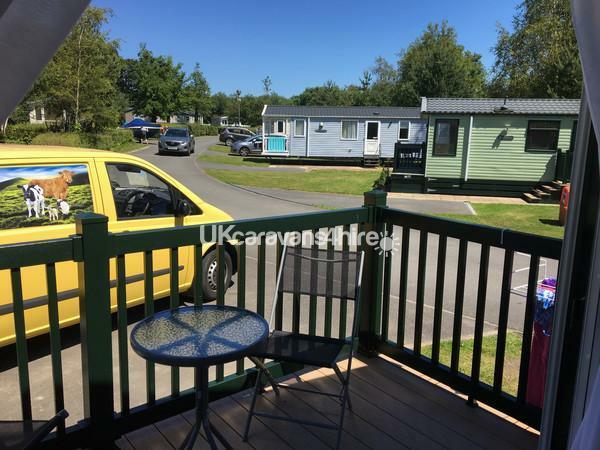 There is a generous parking area (hard standing plus grass parking area) next to the caravan. 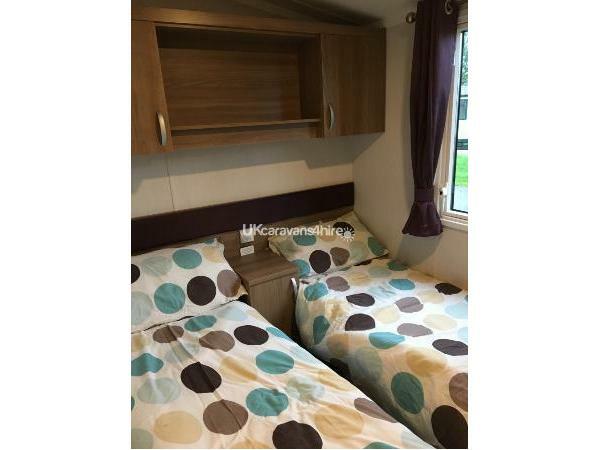 The van is 3 bedroomed and will sleep up to 8 people. 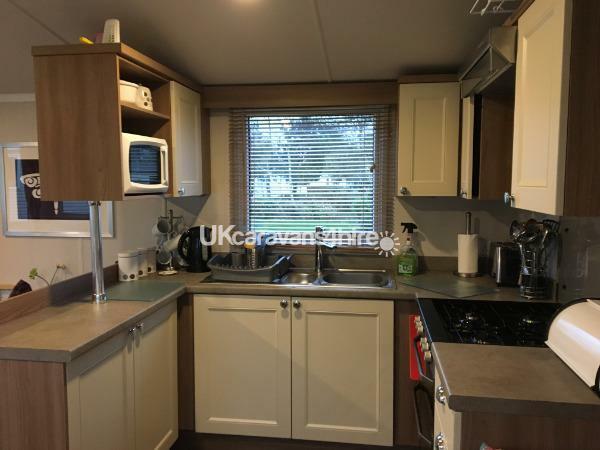 The cost is based on the rental of the caravan, and up to 6 occupants. 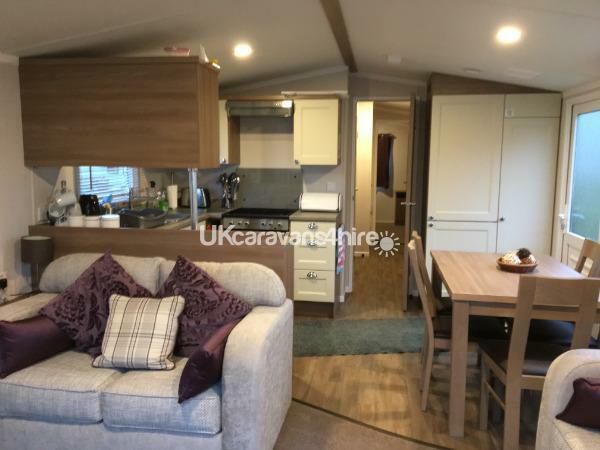 It is very well equipped - we have invested in many new fixtures and fittings over the years, to make the caravan as comfortable and homely as possible. In addition, tea, coffee and milk are complimentary and left as a welcome gesture for guests. IMPORTANT: Duvets, pillows and bathmats are provided, however other bedding (pillowcases, sheets and duvet covers) and towels are not. A non-refundable deposit of £100.00 is payable to secure booking, with the balance due 6 weeks before the holiday. If you wish to bring a well-behaved dog, there is a minimal additional charge of £25.00 per booking (per dog). Dogs will not be permitted in the bedrooms. An additional refundable security deposit of £100.00 is also payable. 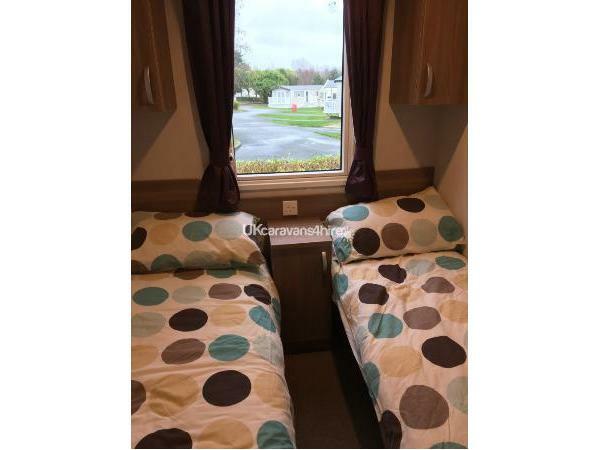 This will be returned within 7 days after you leave, after the caravan is checked providing no loss or damage. Entry is from 3pm onwards and the caravan should be vacated by 10am on the last morning. Please note, this does not include any FUNWORKS passes – if you wish to purchase passes, Haven are happy for you to purchase these on arrival at the site. Purchase of a FunWorks Pass allows use of the swimming pool, children's club, leisure and entertainment facilities. Passes can be collected from Reception on arrival. To follow is a detailed list of what you can expect, however if you have any questions, or have other requirements, please feel free to give me a call, a text, or drop me an email, and I'll do my best to help. • Sheets, duvet covers, pillowcases and towels are NOT provided. • Minimum 3-day bookings; 7-day bookings minimum in Summer Holiday weeks) - we can be flexible, so please contact us! Hafan Y Mor, one of the leading Haven Parks in a scenic coast and mountain setting, with an equally spectacular indoor pool complex including rapids and a toddler pool. "It’s Active with a capital A! There’s an overhead Rope Works challenge, climbing wall and abseiling, boating lake, go karts and loads of other sports and activities to keep you busy at this Holiday Park. There’s also the lure of the mountains, the many other beaches and a great coastal path." Haven also offers plenty of places to eat and drink if you don’t fancy cooking!! Lovely caravan. Great location on the site. A short walk to the main pool and facilities. But far enough away from noise. 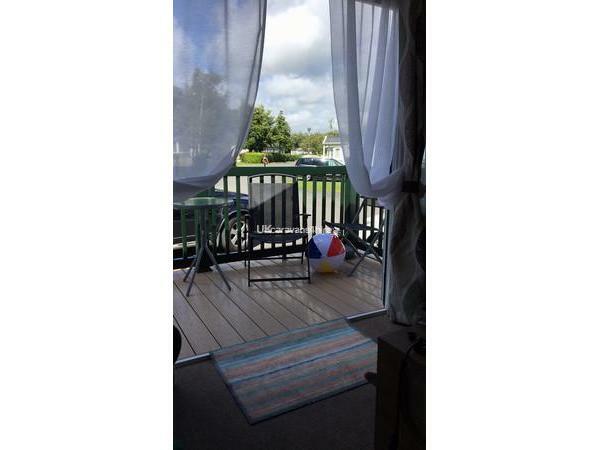 Found hiring a private rental was much more homely than booking direct with haven. Plus you get outside seating and dish clothes etc by booking with Fiona. The little touches like washing up liquid and tea towels were good. Great that I had a TV in the master bedroom. The weather on our holiday was a mixed bag. It started off cold then turned into sunbathing weather. Heating worked a charm so warm and cosy. 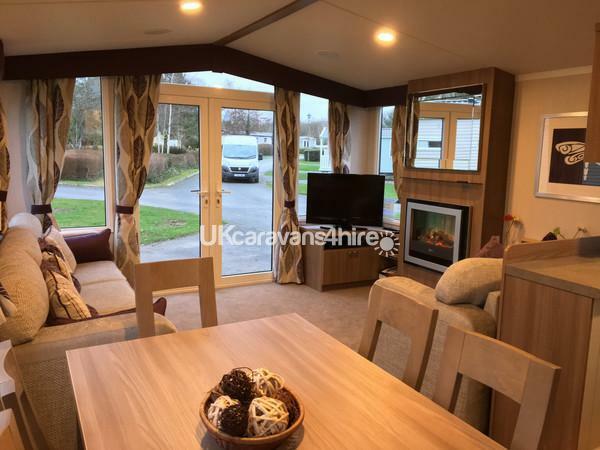 Overall it was a lovely modern caravan that I would recommend to friends and family. Only thing I would suggest is a couple of new garden chairs as one was ripped slightly. Top marks though for this caravan holiday. Loved hafan y mor it's great if you have kids. So much to do and the new areas on the other side of the park are brilliant and it's not far to walk to. Lovely caravan on a great site. Would definitely recommend. Van was lovely and warm easy to find on such a big site will look forward to going again.